BlackBerry 6 is finally coming to the UK as the Torch goes on sale this week. And that means users get the new Universal Search, where you just start typing on the home screen to search contacts, email, calendar, tasks, apps, online services and even inside apps that are built to work with search. At the BlackBerry developer conference last week, RIM announced even more search features. "With BlackBerry 6, I never look for the icons anymore," RIM technical product manager Bhavuk Kaul said; "I just search for the name of the app." 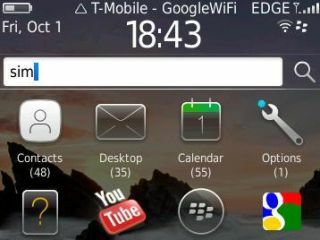 With a future update to BlackBerry 6, you won't even need to search. Kaul said RIM would be adding voice input to Universal Search, so you'll be able to tell your BlackBerry what you're looking for. Voice search will be an extra search provider, and it will be an API that other apps can use. Apps will also be able to sign up to work with search providers that return both search results and ads (and the apps will get a share of the ad revenue). That will work for general searches and for specific things, like local search for finding businesses and venues. So while you can get a Google voice search tool for the BlackBerry today, we might see a lot more search tools that get results from Google or Bing, or a specialised search like a music store – and they'd just work with voice search as well as what you type. Another new search feature will let apps share info. "Right now it's a binary function," said Kaul. "You can either make your content available to everyone or it's just private.